BSP 98 "The Autistic Brain"
Click image above to play audioI hope to post a new episode of Books and Ideas before the end of the summer. Meanwhile the Brain Science Podcast is heading toward episode 100! 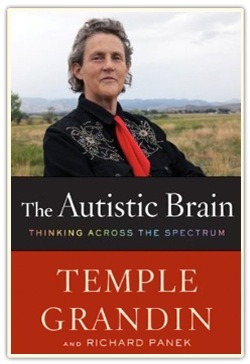 Last month's episode (BSP 98) was a discussion of The Autistic Brain: Thinking Across the Spectrum by Temple Grandin. This book is a tremendous gift, not just to patients and their families, but also to teachers, mentors, friends, and everyone who is interested in understanding how our brains make us who we are. I think that this is a book everyone should read because as we come to appreciate the fact that the strengths and challenges of autism occur across a broad spectrum, we may also realize that some of these issues actually affect people who aren't considered autistic. It is not the label that matters. What does matter is recognizing that each of us has his or her own strengths and weaknesses, but thanks to brain plasticity, we all have the potential to nurture our strengths and, when necessary, accommodate our weaknesses. Please visit the Brain Science Podcast website for full show notes and free episode transcripts. Episode 90 of the Brain Science Podcast is a discussion of Self Comes To Mind: Constructing the Conscious Brain by Antonio Damasio. Damasio's book focuses on the answer to two key questions: How does the brain generate the Mind? and How does the Brain generate Consciousness? His approach is unusual because many scientists and writers treat the Mind and Consciousness as identical. In contrast, Damasio argues that Mind proceeds Consciousness. Listen to this podcast to learn how the Mind becomes Conscious. Click here for show notes and free episode transcript. In his book Beyond Boundaries: The New Neuroscience of Connecting Brains with Machines---and How It Will Change Our Lives neuroscientist Miguel Nicolelis puts his recent work with brain machine interfaces into historical context and explains why this work should change the way we understand how brains work. Nicolelis challenges several long-standing assumptions including the primacy of the single neuron and strict localization, which is the idea that each area of the brain has a relatively fixed function. Episode 78 of the Brain Science Podcast is a brief discussion of the key ideas presented in Beyond Boundaries, including a look at the implications of experiments such as the wide publicized work that culminated in demonstrating that a monkey in Nicolelis' lab at Duke (North Carolina, USA) could control a robot arm in Japan using only its brain. Episode 26 of Books and Ideas is an interview with Sue Bailey and Carmen Flowers, the authors of Grave Expectations: Planning the End Like There's No Tomorrow. This book helps readers to plan for their funeral or memorial service. While this might seem like a strange idea Flowers and and Bailey explain that this can actually be a wonderful gift to leave for one's family and loved ones. In this interview Bailey and Flowers share the personal experiences that led them to write this unusual book and they explain why they wrote it in an overtly humorous style. This interview will help listeners see death and funeral planning in a new way. Send Dr. Campbell email at gincampbell@mac.com or join the Discussion Forum. Episode 53 of the Brain Science Podcast is a discussion of Did My Neurons Make Me Do It? : Philosophical and Neurobiological Perspectives on Moral Responsibility and Free Will by Nancey Murphy and Warren S. Brown. This book challenges the widespread fear that neuroscience is revealing an explanation of the human mind that concludes that moral responsibility and free will are illusions created by our brains. Instead the authors argue that the problem is the assumption that a physicalist/materialistic model of the mind must also be reductionist (a viewpoint that all causes are bottom-up). In this podcast I discuss their arguments against causal reductionism and for a dynamic systems model. We also discuss why we need to avoid brain-body dualism and recognize that our mind is more than just what our brain does. The key to preserving our intuitive sense of our selves as free agents capable of reason, moral responsibility, and free will is that the dynamic systems approach allows top-down causation, without resorting to any supernatural causes or breaking any of the know laws of the physical universe. This is a complex topic, but I present a concise overview of the book's key ideas. Visit the Brain Science Podcast website for detailed show notes and links. Why everyone should read "Dreams from My Father"
During the 2004 Democratic Convention Barack Obama burst onto the US national political scene with a speech that included this line: “I stand here knowing that my story is part of the larger American story, that I owe a debt to all of those who came before me, and that in no other country on Earth is my story even possible.” (Click here for full transcript.) Reading Dreams from My Father gives readers an important glimpse of part of that story. This autobiography was originally published in 1995, shortly after Obama became the first black editor of the prestigious Harvard Law Review. Because it was written before he entered politics, we are given an unusually candid account of his youth and young manhood, which included drugs, personal doubts, and a search for his identity as a black man in America. It is the unusual candor of his writing that leads me to recommend Dreams From My Father to readers of all colors and political persuasions. In The Audacity of Hope, which was published to support Obama’s run for President, one gains an appreciation for his unique blend of idealism and pragmatism, but Dreams From My Father provides a glimpse into how he became the man who defied the odds to become the first Black President of the United States. As a white American I gained a new appreciation of the inner struggles of Black Americans, but I also got the impression that because Obama was raised by his white mother and grandparents, he has the ability to see past issues of race. This ability is one that our nation sorely needs to move forward in tackling the problems that face people of all races and backgrounds. Watching the crowds on election night I was struck by the joy and hope I saw on the faces of young people, both black and white. I think this book is the sort of book one should share with young people because it speaks to the search for identity that drives many young people. One does not get the sense one is reading the autobiography of a future president. Rather it could be any young man’s story. What about those who voted for McCain and who are afraid that Obama is some sort of left-wing radical? Instead of listening to Rush Limbaugh (and others) I would encourage them to read Obama’s words for themselves. Episode 47 of the Brain Science Podcast is a discussion of Principles of Brain Evolution by Georg F. Striedter. My goal is to highlight the main ideas of this complicated, and often controversial subject. Understanding the principles of brain evolution is an important element in our multidisciplinary attempt to understand how our brains make us who we are. Episode 42 of the Brain Science Podcast is a discussion of On Being Certain: Believing You Are Right Even When You're Not by Robert Burton, MD. This part 1 of a two part discussion of the unconscious origins of what Dr. Burton calls "the feeling of knowing." In Episode 43 I will interview Dr. Burton. Today's episode provides an overview of Dr. Burton's key ideas. In past episodes I have discussed the role of unconscious decision-making. On Being Certain: Believing You Are Right Even When You're Not by Robert Burton, MD takes this topic to a new level. First, Dr. Burton discusses the evidence that the "feeling of knowing" arises from parts of our brain that we can neither access or control. Then he discusses the implications of this finding, including the fact that it challenges long-held assumptions about the possibility of purely rational thought. Nancy Yanes Hoffman reviews "When Doctors Become Patients"
I have mentioned Nancy Yanes Hoffman's Writing Doctor's Blog several times in the past. She has graciously allowed me to quote from her recent review of WHEN DOCTORS BECOME PATIENTS by Robert Klitzman. Actually the obstacles between physician-patients and their physicians are more difficult than one might imagine. In my own personal experience I have found that it is actually better when my physician forgets I am a doctor (which seems to be surprisingly easy for male docs taking care of female collegues!). Read the rest of Hoffman's Review Now. Be sure to leave her a comment so that she will know you heard about her blog here. Dan Ariely is a professor of behavioral economics at MIT and author of the bestseller, Predictably Irrational: The Hidden Forces That Shape Our Decisions. He was my guest for episode 19 of Books and Ideas. During the interview he explains how his came to study human behavior. He uses examples from his book to explore the question "What makes a good experiment?" He also discusses how he hope that his findings can help strengthen our society despite our human tendency to make "irrational" choices. Listen to Episode 19 Now. Brain Science Podcast #35 is a discussion of Mirrors in the brain: How our minds share actions, emotions, and experience by Giacomo Rizzolatti and Corrado Sinigaglia. Mirror neurons were discovered in Rizzolatti's lab in Parma Italy in the early 1990's and his book is a detailed to discussion of the experimental evidence in both monkeys and humans. Direct single neuron recordings have been made in monkeys. The evidence in humans is indirect since it is based on mainly on neuroimaging studies like PET scans and fMRI scans. Even so mirror neurons appear to be essential to our ability to understand both the actions and emotions of others. Listen Now. In this episode we also explore the evidence that there are other neurons in the motor areas of the brain that have sensory properties and that the areas of the brain traditionally thought to be devoted to sensory functions also contain neurons with motor properties. Another fascinating discovery is the fact that there are neurons that respond not only to somatosensory inputs (such as being touched) but also to visual or auditory inputs from objects within our peri-personal space. For background on these body maps I recommend listening to Episode 21 and Episode 23. If you are new to the Brain Science Podcast you may want to listen to those episodes first because this week's episode is a little more technical than most. I will be exploring the importance of these discoveries in future episodes. Listen to Brain Science Podcast Episode 35 (mirror neurons) NOW. Go to http://scottsigler.com or http://podiobooks.com/title/infected to learn more. Back in Episode 12 I reviewed the first edition of The Myth of Free Will: Revised & Expanded Edition (2008) by Cris Evatt. I am proud to announce that I have a short chapter in the revised edition "My Brain Made Me Do It." This essay is a reflection on the implications of the recent findings of neuroscience that indicate that a large amount of our brain's decision-making occurs outside our conscious awareness. Even so I argue that the concept of personal responsibility should not be abandoned because our frontal lobes do have the ability to overrule many reflex decisions. I also consider the implications of neuroplasticity. You can find this book in the Books and Ideas aStore within Amazon.com. *As of 12/9/08 this episode has not yet been transcribed. When it is transcribed the show notes on the main Brain Science Podcast will be updated. Please send email to docartemis at gmail.com if you would like to be notified when the transcript is ready (it will be several months). Note: If you would like to comment on this episode please go the the show notes on the Brain Science Podcast website or to the Discussion Forum at http://brainscienceforum.com. What turns an intern into a "real" doctor? How does a green intern become a "real" doctor? I can tell you from personal experience that it is a very gradual process made up of many steps. Some of them are small and later forgotten, while others stay in one's mind years after the details of the events have faded. For me, one such vivid memory was talking to a room full of family about whether they wanted their elderly loved one put on life support. While it was stressful at the time, handling the situation alone, not only gave me confidence, but it shaped how I have approached similar events through out my career. The new autobiography, INTERN: A Doctor's Initiation by Sandeep Jauhar has been reviewed by Nancy Yanes-Hoffman on her blog WRITING DOCTOR'S BLOG by NYHWRITER.COM. Dr. Yanes-Hoffman gave me permission to quote her entire review, but I would rather link to her blog, so that you can see what else you might find interesting there. Arthur Craig: first to study the unique wiring of the insula. Those of you familiar with Orson Scott Card's long-running Ender series know that he has an unusual interest in history and how it shapes political events. In his latest novel, Empire, the assassination of the US president and vice-president lead to a civil war between the extreme right wing and the extreme left wing. The scenario he presents challenges our tendency to assume that such an event could never occur. The near-realism of the story is both chilling and thought-provoking. This is not a feel-good book, but while it is disturbing, it also provides a strong argument in favor of a return to a politics of moderation, in contrast to the increasing polarization of the current political landscape. In the tradition of great science fiction and great storytelling in general, Card uses his characters to communicate an important message. No matter what your political beliefs you will find characters in the story that you can respect and root for. The book comes to a conclusion that is both satisfying and open-ended. The narration by Stefan Rudniki is excellent though you might find yourself wishing for the print version so that you can re-read some of the more complicated arguments. If you want to get this as a free audio download from Audible.com be sure to click on the ad on this page (sorry new members only). I recommend this to all OSC fans and to anyone who enjoys speculative, political fiction.